Made with just two natural ingredients, 99.9% water and 0.1% fruit extract, WaterWipes are the nearest thing to pure water. These handy space saving travel packs are ideal for your handbag, manbag or nappy bag, in the car or in the school bag. 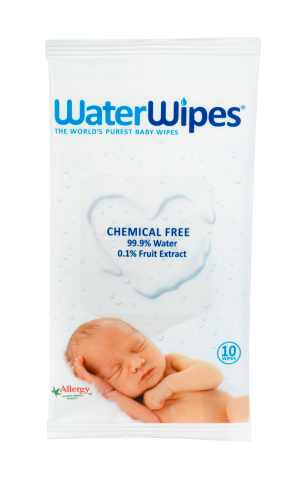 WaterWipes contain 99.9% purified water and 0.1% fruit extract. This amazingly pure and simple product is likely to be a lot less irritating for your baby’s skin than some commercial products which can consist of 2-10% chemical and synthetic ingredients. WaterWipes are the only commercially available baby wipes suitable for newborns and babies of all ages.